In need of ideas for October half term? 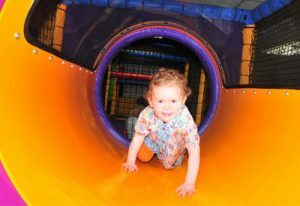 Then why not visit one of our fun and friendly soft plays in Kingston or Wimbledon, where toddlers and children can climb, jump, swing, stretch, wriggle, balance and bounce? Here, your children can be active, use their imaginations and let off steam in a fun, safe environment while parents enjoy a drink and a snack from our onsite cafés. Join the birthday celebrations in The Pod soft play at YMCA Hawker this half term (Mon 26 – Fri 30 Oct) between 10am and 5pm. There will be plenty of fun birthday party activities taking place over the course of the week. All free with entry to The Pod. Enjoy facepainting on Monday, a treasure hunt on Tuesday and play pass the parcel on Wednesday. On Thursday, we’ll make party hats and crowns, and on Friday you can join in with the musical statues party game. The Pod now takes pre-bookings during school holidays and at weekends – call in at the centre or phone 020 8296 9747 to secure your play session today. Also at YMCA Hawker this half term week, our in-house dance instructors Debby, Meryl and Georgina will be running dance workshops for children aged 5-7 and 8-11. Learn new dance skills, routines and make friends at the same time. The workshops take place Mon 26th Oct, Wed 28th Oct and Friday 30th Oct, 1.30pm (5-7 years) and 2.30pm (8 – 11 years). Price per child is £15 for all three sessions. The Pod2 is a fun soft play facility within YMCA Wimbledon (200 The Broadway, SW19 1RY, Wimbledon) for active under 8s. Open seven days a week, Pod2 is available for play sessions, private hire and children’s parties. For a birthday party experience out of the ordinary, The Pod and Pod2 can be hired for a private party for your child and their friends. In the Pod2 at YMCA Wimbledon, your child and their friends will have the soft play all to themselves for one hour, followed by 30 minutes of party food in the party room with a Pod2 Party host to organise everything and clear up afterwards. For more information, click here. At YMCA Hawker, we offer Pod party fun for under 11s. Here, you can choose between the Complete Pod Party or the Ultimate Pod Party. Read more here (insert link).